Design, build, and test your own spacecraft model that has key tools needed to complete a NASA mission at the Design>Build>Test station. 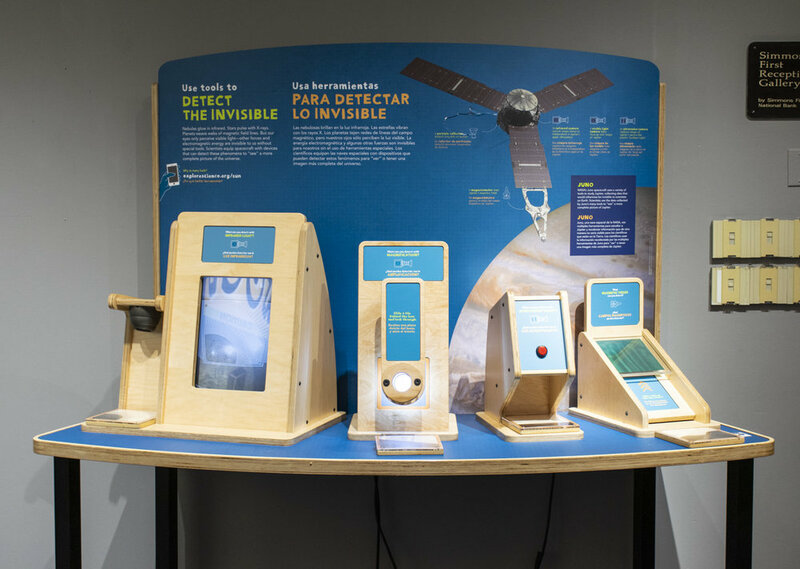 One of the stations in the Sun, Earth, Universe exhibitions lets visitors use an infrared camera, an ultraviolet (UV) light, a magnifying glass, and a magnetic field detector to reveal information not visible to human eyes. Visitors can learn how NASA missions are designed to help answer the big questions about our planet, our solar system and the wider universe in ASC’s latest exhibition, Sun, Earth, Universe. Kids and adults can engineer their own model spacecraft and test its durability for surviving the forces of a rocket launch. They’ll get experience using tools that help researchers see the invisible aspects of space. And visitors will see how data collected can be presented in different forms to help broaden our understandings of what’s happening in space. We Ask Questions About the Sun: Compare images of that show the Sun at periods of high activity, called the solar maximum, and periods of low activity, the solar minimum. We Ask Questions About the Universe: Are we alone? Spin a tumbler of 10,000 beads, representing all of the stars we can see from Earth to search for the unique one that represents our Sun. We Ask Questions About the Solar System: What is it like on other planets? Use colored blocks to create a topographic map of elevations on Venus to learn how scientists use color to visualize data. We Ask Questions About the Earth: How is Earth changing? Compare before and after satellite images of Earth to see how human-caused actions impact our home. Design>Build>Test engineering activity: Design, build, and test your own spacecraft model that has key tools needed to complete a NASA mission. Your Mission to Space board game: Put all your space mission-planning knowledge to the test by playing this board game. Will your mission be the first to be completed? What will you discover? Use Tools to Detect the Invisible: Use an infrared camera, an ultraviolet (UV) light, a magnifying glass, and a magnetic field detector to reveal information not visible to human eyes. The exhibition was created by the National Informal STEM Education Network (NISE Network) in collaboration with NASA. NISE Network is a community of informal educators and scientists dedicated to supporting learning about science, technology, engineering, and math (STEM) across the United States. The Arkansas tour of the exhibition is made possible by a NISE grant to the Arkansas Discovery Network, of which the Arts & Science Center is a member. The exhibition is on display in the Simmons Gallery through Saturday, June 29.